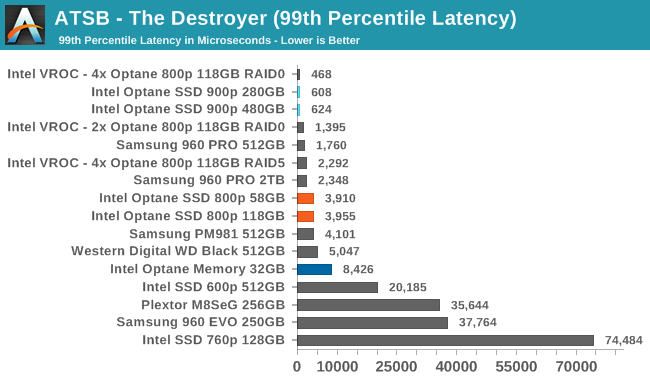 The Destroyer is an extremely long test replicating the access patterns of very IO-intensive desktop usage. A detailed breakdown can be found in this article. Like real-world usage, the drives do get the occasional break that allows for some background garbage collection and flushing caches, but those idle times are limited to 25ms so that it doesn't take all week to run the test. 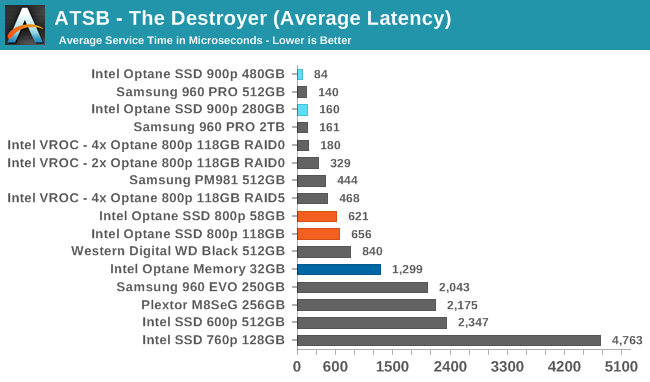 These AnandTech Storage Bench (ATSB) tests do not involve running the actual applications that generated the workloads, so the scores are relatively insensitive to changes in CPU performance and RAM from our new testbed, but the jump to a newer version of Windows and the newer storage drivers can have an impact. We quantify performance on this test by reporting the drive's average data throughput, the average latency of the I/O operations, and the total energy used by the drive over the course of the test. 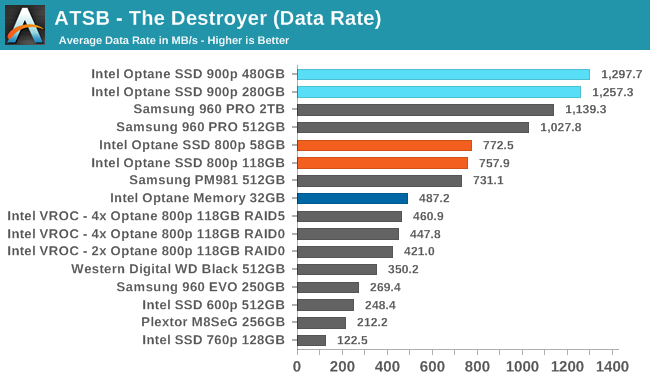 The average data rates from the Intel Optane SSD 800p on The Destroyer are comparable to some of the faster flash-based SSDs we've tested, but the 800p isn't as fast as the Samsung 960 PRO. Intel's VROC clearly doesn't help performance on this kind of test, and instead it just adds overhead. 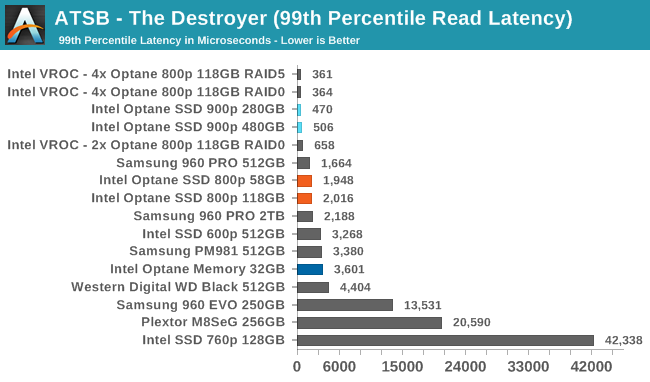 The average and 99th percentile latency scores of the Optane SSD 800p on The Destroyer are good, but don't beat the best flash-based SSDs and are far higher than the Optane 900p. Intel VROC seems to improve latency some even though it was detrimental to the average data rate. The average read latency of the 800p is more than twice as high as that of the 900p, and is higher than the Samsung 960 PRO. VROC RAID-0 adds a few more microseconds of read latency. 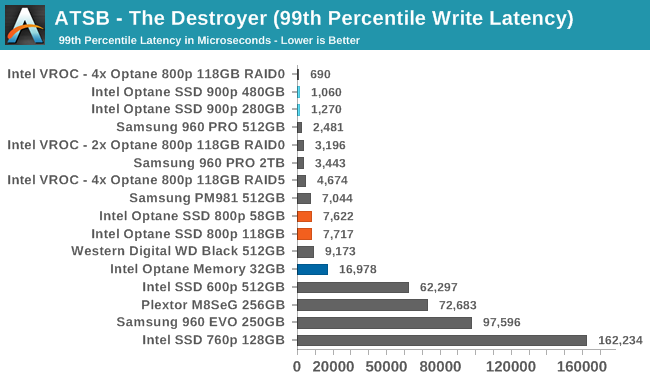 The average write latency of the 800p is far worse than the 900p or high-end flash based SSDs, but VROC greatly improves the write latencies and the four-drive RAID-0 is comparable to the Optane SSD 900p. Intel's VROC helps significantly with the 99th percentile read and write latencies, taking the 800p from not quite high-end to beating a single 900p. 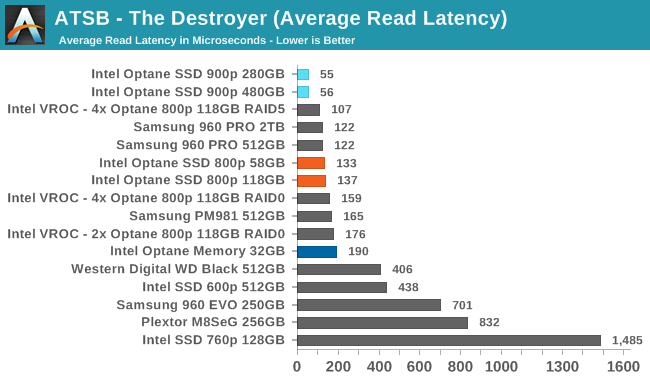 The energy usage of the Optane SSD 800p over the course of The Destroyer is far lower than that of any flash-based SSD. The 800p completes the test fairly quickly, and unlike the 900p it keeps power consumption reasonably low throughout the test. The low-end flash based SSDs can take more than twice as long to complete the test while drawing more power than the 800p. I have an SSD that SMART claims is at 42%. I'm curious to see how this plays out over the next three years or so. But yeah, I'd agree with your point. I've had two SSDs so far fail (many fewer than HDs, but of course I've owned many more HDs and for longer) and both those failures were inexplicable randomness (controller? RAM?) but they certainly didn't reflect the SSD running out of write cycles. 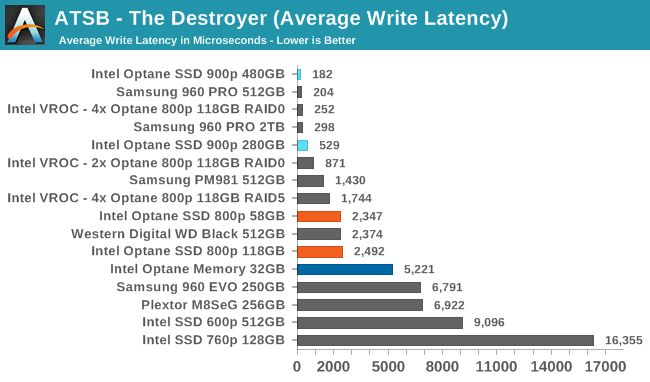 I know ddriver can't resist continuing to use 'hypetane' but seriously looking at this article, Optane appears to be a win nearly across the board. In some cases quite significantly. And this is with a product that is constrained in a number of ways. Prices also are starting at a much better place than early SSD's did vs HDD's. You need to lay off whatever you are abusing. Fantastic results? None of the people who can actually benefit from its few strong points are rushing to buy. And for everyone else intel is desperately flogging it at it is a pointless waste of money. Most people ignore or gloss over the strong low QD results, actually. Which is ironic given that most of the people crapping all over them for having the "same" performance (read: bars in extreme benchmarks) would likely benefit from improved performance at low QD. SSD never had a random R/W problem compared to magnetic disks, not even if you compared them by price to RAIDs and/or SCSI server drives. What problem they might had at the beginning was in sequential read (and especially write) speed. Current sequential write speeds for hard drives are limited by the rpm of the drive, and they reach around 150MB/s for a 7200 rpm 1TB desktop drive. Meanwhile, the Samsung 480 EVO SSD at 120GB (a good second or third generation SSD) reaches some 170MB/s sequential write.